I scoured the Web for examples and best practices for About Us pages on websites. I compiled an article with tips, best practices, and guidelines for creating an effective About Us page. As with everything in the Playbook, the plan is to keep the information updated and relevant. Here are the examples of great About Us pages listed in the current version of the article. Our Father’s Project’s About Us page shares a few photos of the people behind the organization, lists a quick fact sheet, and provides a comprehensive narrative of its history. MailChimp’s About Us page tells a story with well-written narrative, pull-quotes from reputable tech journals like Fast Company and Wired, introduces its leadership with nice photos, and even includes an annual report. 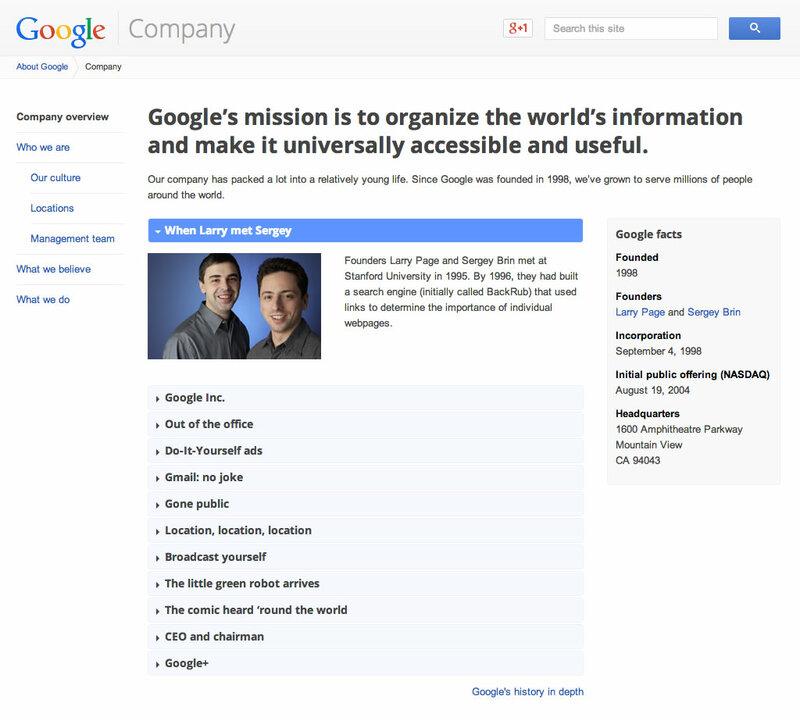 Google’s About Us page lists their mission statement front-and-center, includes a "quick facts" block, displays a summary of its history in an interactive accordion-style control, and links off to more detailed information about its culture, locations, management, and history. This entry is filed under Marketing. Tags: content, playbook, Strategy, web content You can follow any responses to this entry through the RSS 2.0 feed. You can skip to the end and leave a response. Pinging is currently not allowed.